Understanding soil nutrient dynamics in a field is about more than numbers, and a new approach, using a spreadsheet with built-in formulas and a new bioassay, is intended to address some of the problems with conventional soil test numbers. “We look at it – budgets for soil nutrients – as a piece of the puzzle for understanding nutrient dynamics,” says Joanne Thiessen Martens, an agricultural research technician in plant science agronomy at the University of Manitoba. For about 12 years, she has worked on soil nutrition and organic production. In essence, financial budgets are about cash-in and cash-out. A conventional nutrient budget works in a similar way, covering inputs and outflows over a single growing season for a field or even the whole farm. But Thiessen Martens and her colleagues have used a Microsoft Excel spreadsheet to develop a rotation-based nutrient budget to address the shortcomings of a single-season budget. The rotation-based nutrient budget and bioassay tools are currently being piloted by about a dozen agronomists working mainly with organic farmers across the Prairies. They expect to release the tools for general use within the next year or two. The direct appeal is for organic production planning, where growers routinely promote healthy soil biology. It isn’t a planner to tell them what inputs they need for the year, but it will guide them in that planning. The tool considers all the inputs and outputs from that field over the period of the rotation and sums up the change in nutrient status: if you follow this rotation, in the end your soil will have more of this and less of that than at the start. It could be useful for conventional farming as well. The idea of tracking nutrients over time, through a whole rotation, began a few years ago, with Martin Entz. Entz, a specialist in organic cropping systems at the University of Manitoba, teaches students to use the nutrient budget concept as an approach to understanding and managing nutrients. In 2014, Thiessen Martens worked with Entz to develop a more detailed approach using spreadsheet tools. Thiessen Martens used it for two years in her own research and, in 2016, released it to a few agronomists. 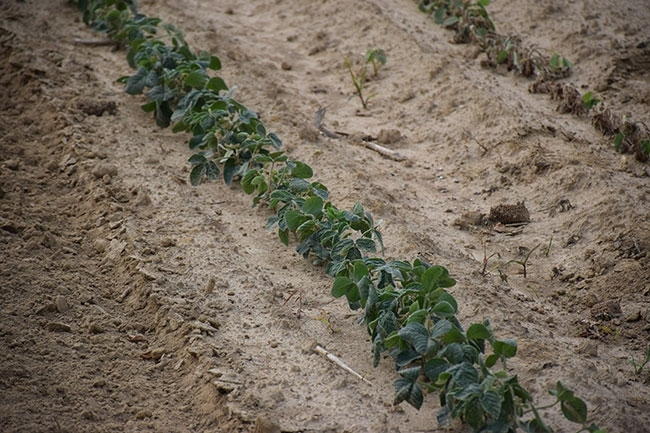 After gaining the initial results from a rotation on one field, the grower can then make substitutes to test the effects from changes in advance. If the field has a deficit, or over-supply, the tool can help a grower reach a “balanced budget” for the nutrient supply over time. It doesn’t take in results from a current soil test, although it is meant to be used with a soil test, and it doesn’t incorporate amounts for micronutrients, Thiessen Martens says. Growers already have access to a variety of nutrient budgeting tools. “Ones I’ve seen tend to be fairly simple, geared to the short term and to conventional production with synthetic fertilizers. They aren’t meant to cope with manures, where every batch or crop is different,” she says. As Entz and Thiessen Martens worked with the nutrient budget concept, they realized that a second tool was needed to fill in the blanks on nutrient content for natural, slow decomposition of organic manure and green manure. The solution was a new bioassay. “We’ve developed a bioassay test that takes samples of a green manure crop at its peak, just prior to termination,” Thiessen Martens explains. “We test that plant tissue for nutrient concentration as an indicator of how well the crop extracted nutrients from the soil. In Roblin, Man., Manitoba Agriculture partnered with the Parkland Crop Diversification Foundation (PCDF) for the northwest region. James Frey, as a specialist for the PCDF, now works with cover crops and integrated farming systems to spur “environmentally minded” production among conventional and organic growers. In 2008, Frey was a technician working with Entz and Thiessen Martens on organic crop research. He was one of the first agronomists to begin using the new nutrient balancing tools in spring 2016. That year he worked with two farmers to apply the new tools in the field. One farmer had an issue with low phosphorus. He and Frey put all the data required into the spreadsheet, then considered results from a soil test, a plant tissue test and the bioassay. They concluded that, despite the extra cost for buying and spreading manure, in the long run, this would be the most sustainable option for that farm. “Organic farmers don’t have the luxury of adding granular fertilizer, and soil tests fail to accurately capture the more nuanced picture of what’s happening in the life of their soils, so they have needed a new tool,” he adds. Quantitative measures of available nutrients are readily available but fall short of the qualitative measures needed for really understanding the dynamic nutrient balance in a field. For instance, he’s seen growers become very alarmed by a soil test report that said a field needed more nitrogen when, in fact, it had recently received a large amount in the form of green manure and the most recent yields were fairly good. “[This test] brings the strength of the number that a conventional soil test [or plant tissue test] can generate, as well as the qualitative observations of an agronomist working with the farmer,” Frey says. Just saying green manure contains 100 pounds of nitrogen may not be useful. Over a five-year period, that nitrogen may give a nice payback in yield and in “building resilience” into the system through factors like disease management, water retention and buffering against compaction. There are also applications for these new tools among conventional farmers who are open to asking broader questions about how green manures and cover crops can fit within conventional agriculture.